If the covertly organised smear campaigns and secretly-funded attacks on public health experts outlined in Nicky Hager’s Dirty Politics seem more suited to an episode of House of Cards, that’s because they could easily be lifted from the dirty politics of Washington D.C. that inspired aspects of the show. As I blogged about earlier this week, Nicky Hager alleges in Dirty Politics that Cameron Slater has been paid by a lobbyist to run pre-written blog posts on the Whale Oil website under his own name, posts that attack individuals raising concerns about alcohol, tobacco, sugary beverages and obesity. The main accusations have been largely left unanswered by the key protagonists, people such as lobbyist Carrick Graham and Food and Grocery Council chief executive Katherine Rich. America’s Health Insurance Plans, the big lobbying and PR group for health insurers, secretly funneled US$1.593 million to its longtime ally, the National Federation of Independent Business, to pay for a TV ad targeting Democratic senator Mark Pryor of Arkansas. The ad blames Pryor for making it harder for small businesses to make a profit as a result of his vote for “Obamacare.” The ad didn’t mention that the funds to pay for it came from health insurers or that the spot was part of a continuing effort by AHIP to get Congress to eliminate a fee that was imposed on insurers to help offset the cost of expanding coverage to the uninsured. The payments only came to light when the New York Times queried tax records which revealed the payments and the parties involved. It turns out that the US$1.6 million for the TV ads was a relatively modest spend. 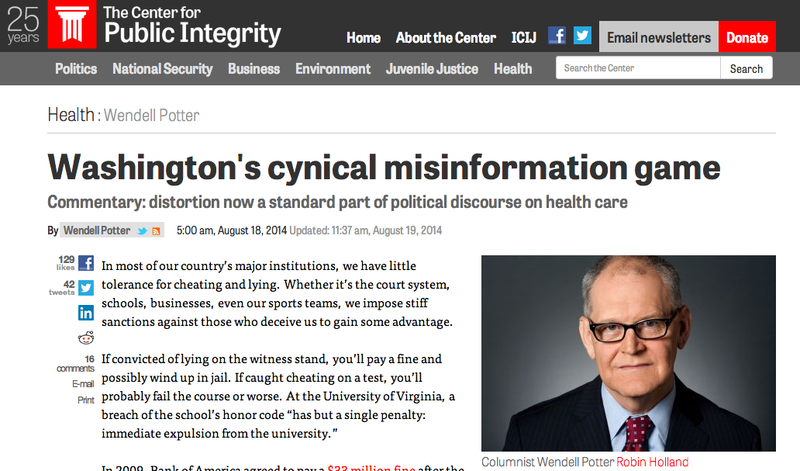 As the National Journal reported in 2012, AHIP funnelled more than $100 million to the Chamber to finance it’s campaign to shape the health care reform debate in 2009 and 2010. As with the Times’ disclosure of the AHIP-NFIB alliance, the AHIP-Chamber of Commerce relationship was discovered only after a couple of reporters checked tax filings. Now you see where Whale Oil and his collaborators get their inspiration from… Dirty Politics details numerous points where the protagonists looked to US political tactics to inform their efforts here. Read the book or Google “rat f*cking” for more on one such tactic drawn from the Republican Party play book. That’s the way the game is played in Washington, where ethical principles that apply elsewhere are blatantly flouted. And where the consequence of getting caught in a lie or deception is rarely more severe than a bad PR day. A bad PR day indeed for those implicated in the leaked emails.